Does the world's most popular iPod really need an FM radio and a video camera? Apple's annual iPod shindig on 9 September managed to be both underwhelming and forehead-slappingly frustrating in equal measure. On the one hand we were gifted with some minor makeovers, new colours and slightly lower prices. And on the other, we saw some features that by rights should have been stuck into the iPod touch, but were shoehorned into the itsy-bitsy iPod nano instead: We're looking at you Mr Video Camera. Duh. Also new to the iPod nano are a decidedly old-school FM radio, a slightly bigger 2.2-inch display (up from 2-inches), fingerprint-attracting glossy finish and a choice of nine fabulous colours – the 16GB version on test is finished in gorgeous gold. Grown-up gals and excitable teens will love it, but what about us geeks? 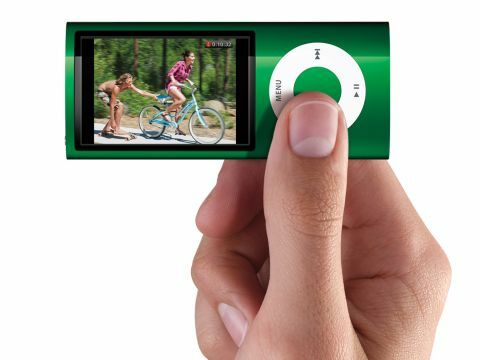 Once you get over just how tiny and shiny the iPod nano is, our attention naturally falls to that video camera. You'll find it on the back of the iPod, but it's so small and tucked out of the way you could almost miss it. It's capable of shooting 640 x 360 pixel video (erm, riiigght) and comes with 15 wacky special effects to make your video (and, by extension your life) look way more interesting and exciting than it actually is. Apple says it's all a bit of fun, and puts a video camera in everyone's pocket so they can shoot footage wherever they are without having to lug a pesky camcorder around. In other words, its like the FlipVideo or any mobile phone camera from the last five years. Happy Slappers will be delighted.